From Goodreads: Many of Peter and Kelsie Dalton's friends thought they were crazy when they bought Ridgeview Station. But five years on, their hard work, help from Kelsie's parents, and record rainfall have them in high spirits as the summer muster approaches. Everything is going smoothly with the muster before disaster strikes and the Dalton's find themselves battling to save their livestock, their property and their lives. 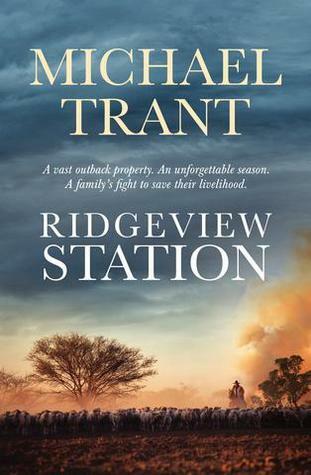 A few thoughts from me: Ridgeview Station, the debut novel by Michael Trant, is a portrait of life on a sheep station in Western Australia-- for some readers, such as myself, a setting that is entirely foreign. Trant tells his story from the heart, and you can feel the deep affection he has for his characters and the work that they are doing. When disaster threatens to strike at Ridgeview, threatening the livelihood of Kelsie and Peter and their family, the tension is immediate and exciting. I learned a lot reading this book, and while it's from a genre I wouldn't usually read (my usual wheelhouse being historical novels), I am glad that I picked it up. Highlights included the four dogs, each with their own personalities, the interactions between Bull (a foul-mouthed visitor to the property) and Lisa, the mother-in-law who keeps everyone in order with a firm but ladylike hand, and the development of the different relationships between the characters. I was lucky enough to interview Michael in person at the Bassendean Memorial Library last month, and he was a delight to listen to. This won't be the last we hear of from this new member of the WA Writing scene. You can catch Michael Trant at next year's West Coast Fiction Festival.